The leaves are gone, the temperatures have dropped, and in many places, snow has already fallen. There’s no question – winter is now here, and with this season come obstacles unique to cooler temperatures. For example, just one snow or ice storm can create problems that last for days or even weeks. Slip and fall injuries experienced by members and staff are among the leading injuries reported by fitness clubs. In 2015, the U.S. Bureau of Labor Statistics reported more than 223,000 non-fatal falls on the job, although this number is thought to be much higher due to unreported falls. At FITELIFE, we work to help our insureds take steps to prevent slips and falls, which can become much more of a likely hazard to members and guests during the winter season. 1. Regularly inspect potential problem areas for moisture. There are some areas that are going to be at a greater slip and fall risk than others. It is crucial that these places are regularly inspected to ensure they are dry and safe. These areas include entry ways, ramps, or hallways. 2. Clean up spills and dry wet floors immediately. Make it a top priority to dry any wet floors. 3. Prepare the parking lot surfaces for snow and ice before and after a snowstorm. One of the hardest things to see when crossing a parking lot is ice, especially at night. Club owners should be sure to keep their parking lots safe. This includes treating the asphalt and sidewalks with salt to help prevent ice and marking known frozen places with cones or other markers. Make sure that your snow removal professionals, be it an employee or a contracted company, are adequately prepared for the season. Another thing to consider is what the club owner is legally responsible for, as stated in their lease. When possible, have the contracted company carry the risk in their policies and request to see that proof of insurance. 4. Provide moisture absorbent mats, rugs, or runners in entryways. At the entrance, club owners should make sure to have a place where people can dry their shoes. It should be made of a water absorbent material to ensure that no extra water is being tracked onto hard floors. Club owners should make sure the rugs are non-skid and tape them down to prevent rolling. Another option many club owners are considering these days that we support is installing flooring surfaces with more grit to prevent slip and falls. 5. Ensure there is adequate light, both indoors and outside. Make sure all hallways, entryways, and common areas are well lit. Equally as important is to properly light the parking lot and sidewalks outside the club. In the winter when ice is a real threat, bright lighting can be the difference between an injury or a safe experience. Even with all these precautions, accidents can still happen. When they do, it’s vital for club employees to know the proper protocol. Club owners should make sure all staff members report any falls, no matter the severity. Safety should be a part of company culture. 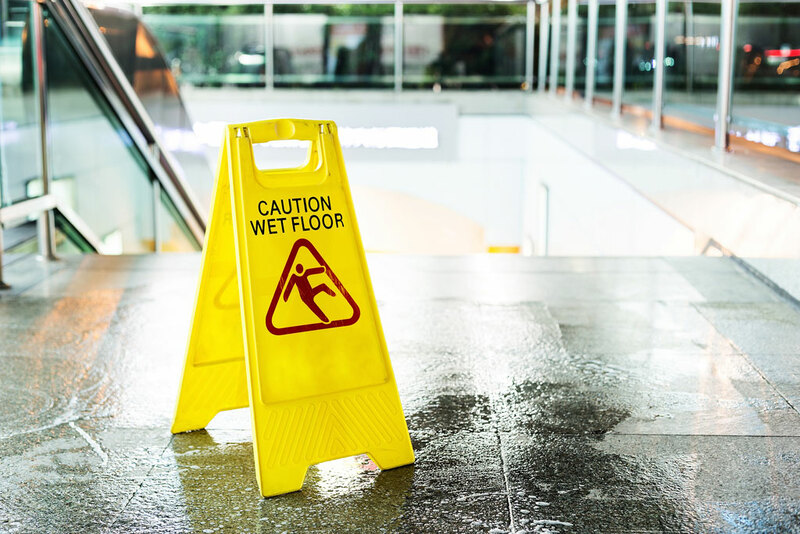 With a cold, wet winter comes an increased rate of slip and fall accidents, but with proper preparation, these risks can be mitigated. By following these 5 tips, club owners can make their fitness clubs safer for both the employees and members. Brian Rawlings is Practice Leader for Venture Programs and has spent his career working in fitness and insurance. At Venture, Rawlings is leading the new FITLIFE™ program, which insures fitness, wellness and spa facilities. He can be reached at brawlings@ventureprograms.com.